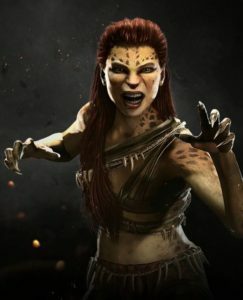 This page contains a character guide for Cheetah in Injustice 2. Here you’ll find movelists, combos, juggles, strategy guides and recommended gear for the villain character. For more Injustice 2 content, head over to our Injustice 2 top page. The Cheetah is a super-villain legacy of characters with feline characteristics who usually fight Wonder Woman. There have been several different people to use this alias. Priscilla Rich was the original during the Golden Age, and Deborah Domaine was the Silver Age version. Barbara Ann Minerva is the current contemporary version. The character has been involved with Villainy, Inc., the Injustice League and the Secret Society of Super-Villains. Cheetah possesses enhanced strength, speed, durability, stamina, and agility all comparable to Wonder Woman, allowing her to fight the Amazon on an even playing field. Her claws are strong enough to cut and wound Wonder Woman, and Minerva possesses a genius level intellect. Cheetah’s opponent must be ducking to connect Savage Ambush. Meter Burn R2 (must press R2 in the middle of Savage Ambush). Cheetah’s opponent must be standing to connect Deadly Hook. Grants Cheetah a damage buff on all claw attacks. Below are combo and juggle inputs for Cheetah , including corner strategies and restarts. Cheetah is a human/cheetah hybrid, her body covered entirely in fur. She covers her lower body with a silver corset like clothing that has the edged, armored look most characters in Injustice have.